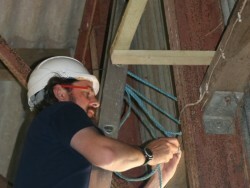 Hook-over: For attaching a nestbox to a horizontal beam. 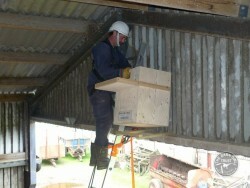 Sliding battens: For a corrugated sheet wall with horizontal rails. 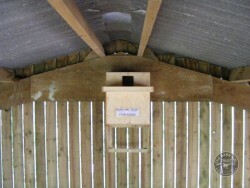 U-shaped frame: For a timber wall rail that’s not wide enough to support the nestbox. Pair of stilts: For attaching an owl box to a vertical wood surface. 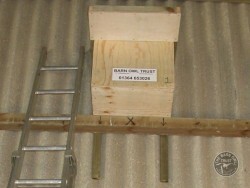 Back bar: Uses a timber bar attached to the back of the box and a couple of wooden ‘hooks’. 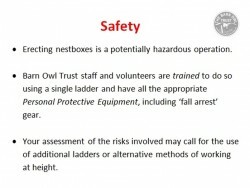 Safety First: Make sure the ladder is tied off, all your PERSONAL PROTECTIVE EQUIPMENT is ready, and put your hammer on the exercise platform of the nestbox. If you are erecting the owl box in someone else’s building, always put your name and phone number on it in big letters (so it can be seen from the ground.). AND don’t forget to put the lid on! Hook-over 1. 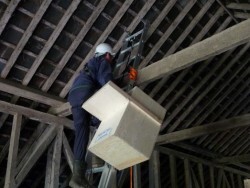 The hook-over method is a quick and easy way of attaching a nestbox to the bottom chord of a timber roof truss. Hook-over 2. 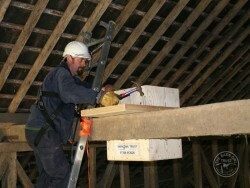 Measure the thickness of the truss timber. ALWAYS pre-drill both the nestbox bearers so that you can nail down through them easily with no risk of the wood splitting. Hook-over 3. Make your safety checks. Hook-over 4. Lift the box keeping it below waist level. Hook-over 5. Now pass the box under the beam, reach over and grab it with your other hand. Hook-over 6. Now pull the Exercise Platform of the box over the beam. 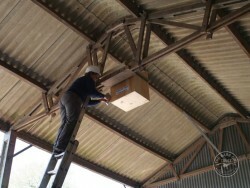 Put an arm through the ladder to hold the box in position. Then pick up the hammer and drive the nails home. Hook-over 7. Label the box and put the lid on! Hook-over 8. 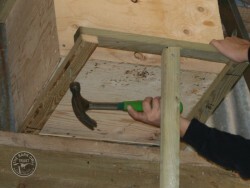 If the roof truss does not have a horizontal beam you can often adapt the hook-over method by adding an extra piece of wood. Sliding battens 1. 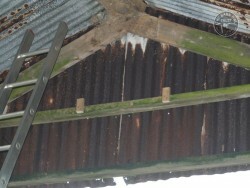 The ‘sliding battens’ method is great where you have corrugated sheet material against (horizontal) steel or concrete wall ‘rails’. Sliding battens 2. 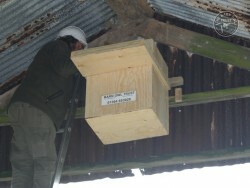 Measure the height of the nestbox, go up the ladder and make sure there is 400mm clear space ABOVE where you want the box to go. 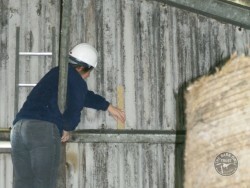 Then make sure the gaps are big enough for the battens to slide down behind the rail. Sliding battens 3. Now measure the distance between the corrugations center-to-center (where the arrows are in the photograph). Sliding battens 4. If it’s old galvanised steel with small corrugations you can open up the gap by driving in a couple of wedges cut from batten. Sliding battens 5. 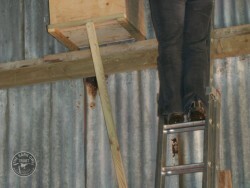 Now screw parallel battens to the back of the nestbox that project 400mm below. Make sure the distance between them exactly matches the distance between the corrugations. Sliding battens 6. 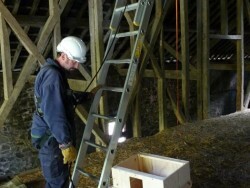 Make sure the ladder goes higher than where the nestbox will go and is securely tied off. U-shaped frame 1. The U-shaped frame method is useful where you have a timber wall ‘rail’ that is not wide enough to support the box while you secure it. U-shaped frame 2. 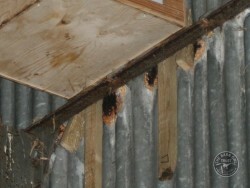 Simply screw or nail lengths of batten together to make a 3-sided frame that’s a little bigger than the bottom of the nestbox. Bang the nails in part-way. U-shaped frame 3. With one arm through the ladder. 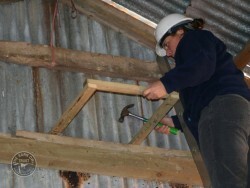 Nail the frame into position allowing enough head-room for the nestbox to sit on the frame. U-shaped frame 4. 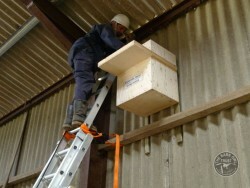 Now reposition and tie-off the ladder so that it reaches higher than the intended nestbox position. U-shaped frame 5. Carry the nestbox up keeping it low in relation to your body and lower it onto the frame. If you need both hands, make sure one arm is through the ladder. U-shaped frame 6. Now secure the box to the frame. Nailing downwards or using screws is preferred! U-shaped frame 7. Fixing a ‘prop’ underneath is not essential but do make sure the box is sufficiently secure for future nest-inspections and safe clearing-out. Pair of stilts 1. 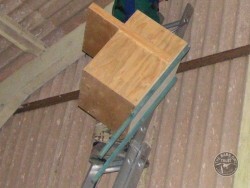 This is a good method attaching a box to a vertical wooden surface. When we are out nestboxing for a day we usually carry a few ready-made pairs of stilts with us. Pair of stilts 2. Simply screw them to the wall checking they are level and the correct distance apart. 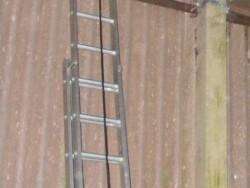 Then extend the ladder so the top is well above them and re-tie it. Pair of stilts 3. 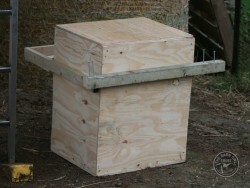 Carry the nestbox up keeping it low in relation to your body, lower it onto the stilts, then secure with screws. Pair of stilts 4. 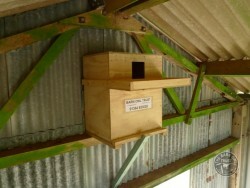 Stilts can also be used to support a nestbox below a vertical surface. In this case only the top third of each stilt is attached to the building. Back bar 1. Although rarely needed in buildings, this is a good method to have up your sleeve. 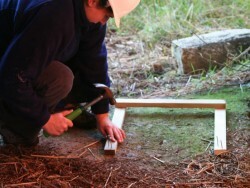 First, strongly attach a length of timber across the back of the box. Back bar 2. 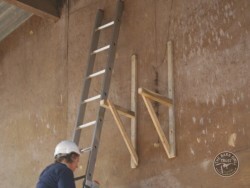 Now attach two bits of batten to act as ‘hooks’. Back bar 3. 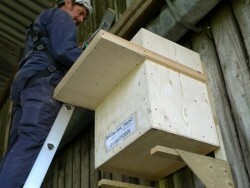 Carry the nestbox up keeping it low in relation to your body, lower it onto the hooks, then secure with screws. 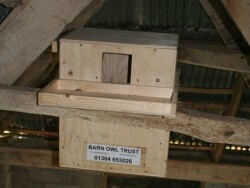 (You may need an extra piece to hold the bottom of the nestbox away from the wall). 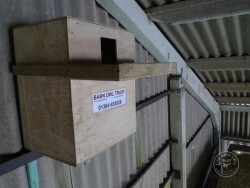 How to make an indoor Barn Owl box – Our recommended safe design. 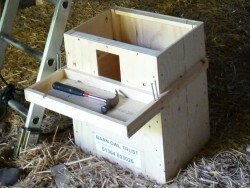 Buy a Barn Owl nestbox – Ready-made boxes from the Barn Owl Trust.